A weekend fiddlers' convention, Nov. 7-9, 2014 in Westford, Massachusetts. Fiddle Hell 2014, basically a fiddlers' convention, is less than two weeks away! This year's Fiddle Hell will be held Fri-Sun, Nov. 7-9 at the Westford Regency in Westford, Massachusetts. Mr. Scratchy and I are planning to attend. We attended last year and had a great time...and learned a lot! This year's line up of workshops, jams and instructors looks even better than last year, if that's possible. Plus, they've moved the event to a larger venue because attendance has been growing each year and they finally out-grew the venue where it had been held the past several years. I highly recommend this event...the program includes sessions for fiddlers of all skill levels and it's a great opportunity to meet other fiddlers. If you're within driving distance or can travel, consider attending Fiddle Hell. If you can't make it this year, put it on your calendar for next year: Nov. 6-8, 2015. Now that's my kind of conference! Sounds like a lot of fun. Take pictures! cdennyb I know exactly what you mean. I'm way up here in Oregon. we get nothing like that up here. I hope you all have fun at this. some workshops would be pretty nice to attend. Sounds like a blast Diane. I am so excited for you again this year. We do have some functions out here. I have to get busy and look. There was something out this way in Red Bluff, CA last week. Vy Wickham (sp) was there. I didn't find out in enough time to plan for it. And I know Fred has been to some fiddly functions, maybe Lake Tahoe? Not sure. Can't wait to hear the details and see how much more awesome you become. I was blown away a couple of years ago when I learned -- right here on Fiddlerman.com -- that this event existed and it was held just up the interstate from where I live. It was a post by Mr. Jim @Worldfiddler that referenced Fiddle Hell, just after the 2013 event. I put Fiddle Hell 2013 on my calendar immediately. One wouldn't expect such a large gathering of fiddlers around here...New England has a distinctive fiddle style but fiddle music isn't as mainstream as it is elsewhere, like in the South. At best, you're most likely to hear fiddle music in the many Irish pubs in the Boston area. I will try to remember to take some pictures and will give a full report afterward. That is SOoooo SWEET you can go. I am sad I wish I could go to one of these GiGs > I would be in La La land!! > Please keep us posted and pics and vids if you can. Thought I'd give a little report on Fiddle Hell 2014 and share a photo and video from the weekend. 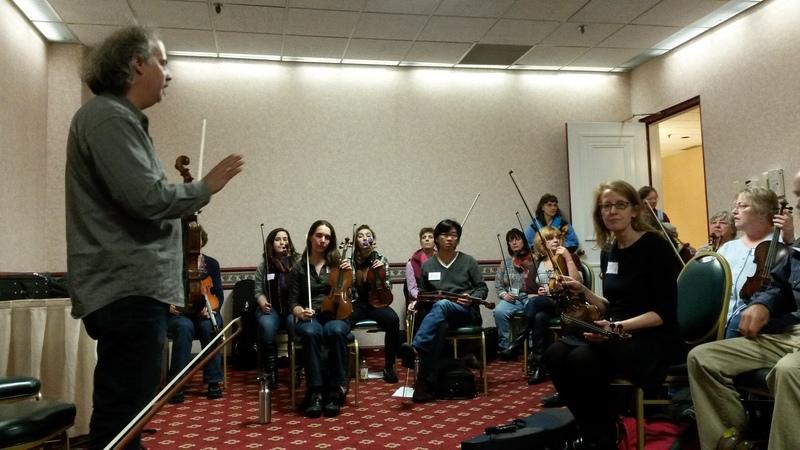 First of all, this is an excellent event and learning opportunity for fiddlers of all levels. It runs two and half days and the program is packed with workshops and jams for all skill levels and fiddle styles. This year, Fiddle Hell moved to a new, more spacious venue. It was much more comfortable for playing and learning in the workshops, and was better for meeting and conversing with other fiddlers. I attended sessions at the "Beginner-Advancing Beginner" and "Advancing Beginner-Intermediate" level (I'd put myself in the Advancing Beginner category) on genres including Irish, Bluegrass, Quebecois and Old Time. Although some instructors offer sheet music for the tunes they teach, most of the learning is by ear. When sheet music is offered, it's usually distributed after the session. I found that I did well picking up a tune by ear in some sessions, and not so well in others. Don't know why exactly...could be teaching style, musical style, or fatigue on my part (I seemed to do the best early in the day, not surprisingly). The instructors are excellent, well known fiddlers. Their CDs and instructional books are available for purchase in the registration area. The jams were fun, too. I participated in several slow jams and enjoyed just listening in on some higher level jams, which popped up in hallways and the pub. I highly recommend this event. Mark your calendar...Fiddle Hell 2015 will be November 6-8. Start saving for the travel and/or ask for the time off from work. It will be well worth it. To give you a little taste of what Fiddle Hell is like, here's a photo from one of the sessions and video clips of a hallway jam and a jam in the pub. Awesome Diane...thanks for the update. Very cool about the ear playing. I would be SOL on that. Sounds like a great function. Congrats on Surviving Fiddle Hell. WOW, loved the videos! That would so much fun to go to. I just see so many potential violinists/fiddlers getting a few drinks in them, opening up and really kickin' it in high gear! Awesome, Thank You, Thank You, Thank You for posting. Thanks for the report, Diane! I missed it this year, but am planning on being there next year, for sure! I was an instructor there from 2007 - 2010, and as Diane says, it's a great event. I thoroughly enjoyed teaching and jamming there, every year! I second the recommendation and would love to see some of you guys and gals next year! It looks like it was huge fun. Thanks for sharing @kindascratchy - this looks like so much fun! I would LOVE to attend something like this. Very cool!! Thank you for sharing. We have the 49th Annual Bill Monroe Bean Blossom Bluegrass Music Festival coming in June 13-20, 2015. I really need to attend!! It's less than an hour from home for me, too, @Ripton . We must live not too far from each other...of course you could be less than an hour in another direction. Hope you can make it next year...Fiddle Hell is great. Fiddle Hell 2015 will be Nov. 6-8. Put in your request to get the weekend off now! @Schaick, maybe we could meet up there this year. I live outside of Gnaw Bone. @ MrYikes That would be fun. I for sure am doing the SATURDAY JUNE 21st - Ellenberger Park, 5301 E. St. Clair St. FREE and open to all ages! hehe!! There is a picture of me playing the fiddle. OH my goodness!! That was back before I started going to Jam - I think can't remember for sure!